Every spring, districts have to submit their original budgets. Every fall, districts have to submit their interim budgets. With fall just around the corner, it is time to start reviewing budget line items. As you well know, the majority of your budget is salary and benefits, so Escape Online gives you two ways to review those benefits. From the salary account. The Benefits tab of the budget salary account shows the benefit accounts and amounts for that salary account. The list will show a line for each employee for each benefit type. For example, if you had three employees budgeted to a salary account, the list would show multiple lines for each employee (e.g., STRS, SUI, dental, medical, etc.). From the benefit account. If you go to the actual benefit account, you can see all of the items from the salary accounts for that single benefit account. You can also add and edit manual benefit entries, including the budget amount, projection amounts, description and comment. 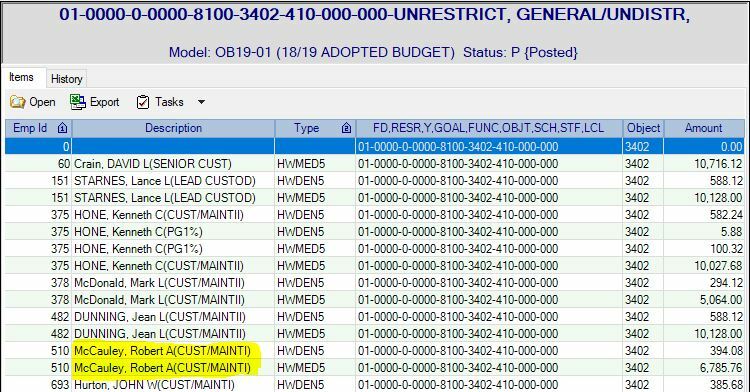 However, you cannot edit system-generated entries created by loading salaries through the Budget Management activity. Check it out! First, let’s look at the salary budget item and the Benefits tab for that budget item. Then, let’s look at the information from the benefit budget item. This is the Budget Entry Salary Account. On the Benefits tab of the salary account, we can see all of the employees’ benefits for that salary account. Notice that Robert McCauley has numerous benefits, two in particular for account 01-0000-0-0000-8100-3402-410-000-000. This is the Benefits account (01-0000-0-0000-8100-3402-410-000-000). We can see all of the employees with this benefit. Again, we see the two line items for Robert McCauley. This two-way mirror into the benefits for employees provides greater transparency into your budget!